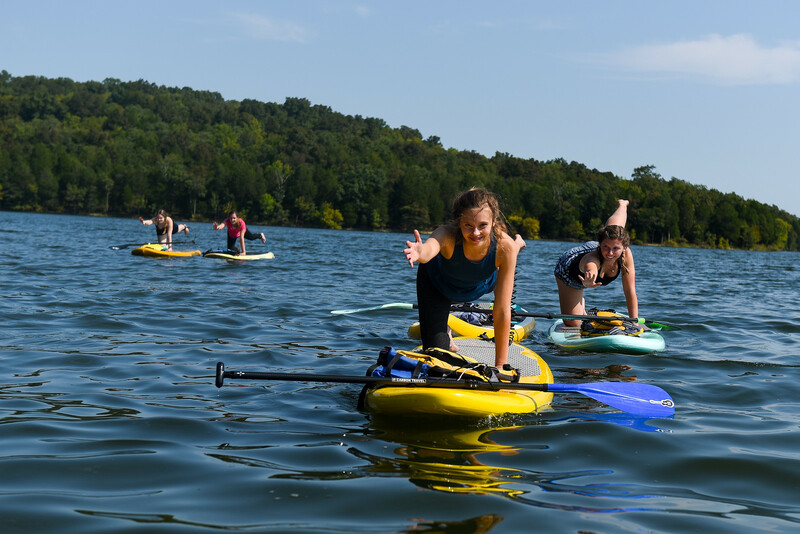 Student do paddle board yoga at the lake at Belmont University in Nashville, Tenn. September 9, 2017. These programs are just a few of the many opportunities offered to students, faculty, staff and alumni through Belmont FitRec. In addition to off campus outdoor excursions, the department also offers on campus options for sports and recreation. Intramural sports include spikeball, flag football and volleyball, among others, and Belmont club sports include tennis, swimming, equestrian, hiking, and many more. As part of their outdoor programming, FitRec also hosts an annual Boulderdash Climbing Competition, which aims to test men and women against gravity while building outdoor community. Last year, 26 climbers participated in the climb, and another 65 students participated in its accompanying convocation. For a full list of events and group fitness classes, visit the campus calendar. Membership to the fitness center is included in all tuition and fees for students and is free for all faculty and staff. Memberships are also available for purchase for alumni and family members. The Department of Fitness and Recreation exists to provide members of the Belmont community with facilities, programs and services that educate, promote and support a healthy and active lifestyle.